When I was a student of Metalsmithing in the late 1960's, this was the definitive textbook for silver- and goldsmiths. 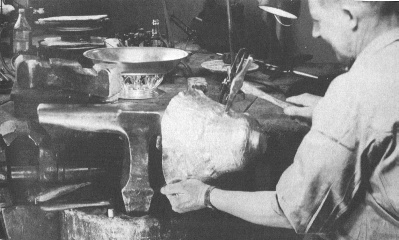 Prior to Untracht's book, most metalsmithing books were either basic primers or pretty picture books but few, if any, delved into many of the more esoteric techniques available to the modern metalsmith. Oppi Untracht remedied that problem many times over in this fine text. Oppi Untracht was a Fulbright Scholar in both India and Nepal from 1957 to 1959 and 1963 to 1965 respectively, and during those stays he visited many metalsmiths, studied their art and took copious photographs of their work. Much of what he learned in India and Nepal is included in this book, including filigree, enameling (his forté), niello, bidri, kuftgari and others. The majority of the illustrations for this volume appear to originate with Untracht's eastern sojourns, and the scenes of craftsmen producing magnificent works using the most primitive of techniques and tools are truly fascinating. Color photo of same blower still made today. Image courtesy Bison Forge, New Deli, India. While some of the techniques may have originated centuries ago and thousands of miles away, Untracht details the processes sufficiently for the craftsman to become familiar enough with each technique to pursue further experimentation and learning. This exposure to the techniques of a culture other than one's own can be both intriguing and educational, but the real strength of Untrachts's book lies in his clear explanations of techniques, starting with the most fundamental and progressing to the more advanced and sometimes even arcane techniques that can take dedicated students years to master. Beginning with an overview of the process of manufacturing the metal itself, from ore to final rolling, Untracht provides some of the history and metallurgy connected with the materials commonly used by artist metalsmiths. The chemistry, physics and folklore of the metals are covered in the beginning of the book, and several charts are provided at the end of the book giving the physical properties of metals, drill sizes, chemical formulae, etc. In looking over my copy of this book in preparation for this review I was interested to note that the appendix pages bore much evidence of repeated use over the past thirty or more years. Indeed, I doubt that more than a week or two goes by that I do not find myself pulling down this volume to verify a fact or confirm a theory. 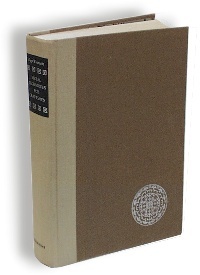 The book progresses in logical sequence from the simple techniques to the more advanced, with clear and concise descriptions and illustrations more than sufficient to allow the student or artist to learn the material. The tools, the techniques and the aesthetics are all covered in adequate detail to allow the student to progress naturally and comfortably from one level to the next, while ample material is provided for the advanced metalsmith to foster entirely new explorations in metal. 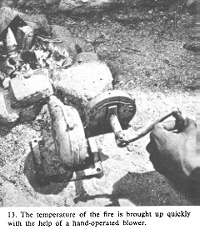 And, while the main thrust of the book is clearly geared toward the jeweler/artist/metalsmith, there are chapters on forging, welding, spinning and fabrication techniques that apply to steel and iron as much as to silver and gold. The well-rounded metalsmith will have a command of many techniques outside his own immediate field or he will find himself constrained to such a narrow venue that it soon becomes stifling. 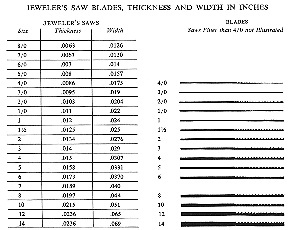 Knife makers use many of the techniques of jewelers in the fitting of furniture to their blades, many blacksmiths employ non-ferrous metals for accent or special purpose in their iron works, and armourers and re-enactors often find themselves in need of techniques borrowed from silversmiths. 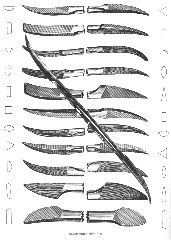 Page 96, Dixon catalog illustration of chasing tools. I am frequently asked for a recommendation for a good book covering the subject of non-ferrous metalsmithing techniques; this is the one book that I unhesitatingly recommend, knowing that it is both broad in scope and accurate in detail. Oppi Untracht's fine book is a worthy addition to any metalsmith's library. 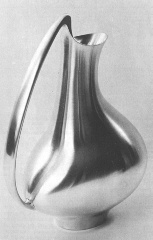 Silversmith raising a vessle designed by Henning Koppel. One of 13 step by step figures. 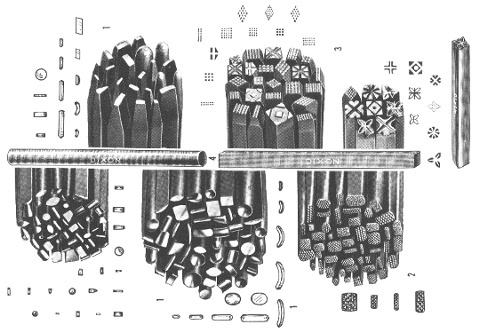 Examples of the many plates from the old William Dixon catalog reproduced in the book. The William Dixon Company, which was established in 1868 and was located in Newark, New Jersey. 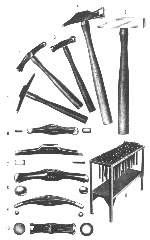 The William Dixon Company supplied tools to the jewelry, dental and optical industries. In 1964, Grobet purchased the company. The silversmiths files are labled "Glardon". Glardon is a world renowned brand name for files produced by Usines Metallurgiques de Vallorbe. This company, made up of Grobet, Glardon and Borloz, the three principal manufacturers in the region at that time, was formed in 1899 to expand their sales of files well beyond the Swiss border. © 1968 Doubleday and Company, Inc.